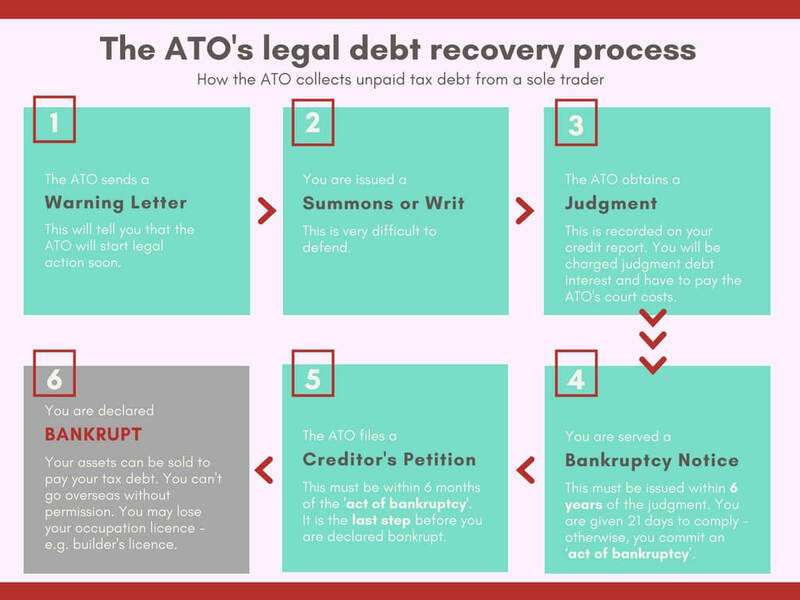 These are the steps that the ATO takes when it starts legal action to recover a tax debt from an individual (i.e. as a sole trader, an employee, or a partner in a partnership). Different steps apply to a company that owes the ATO a tax debt. When will the ATO use legal action to collect a tax debt? if your tax debt seems to be increasing and no payments are being made. The ATO will usually send a ‘Notice of Intended Legal Action’ or a ‘Firmer Action Warning’ to you before starting any legal action. Both of these letters warn you of the steps the ATO can take if you do not pay your debt. If you still don’t pay your tax debt, then the ATO can take the following steps to recover the amount from you. These steps can ultimately end up in you being declared bankrupt. The first step in the legal process is usually a formal letter that is issued by the ATO under the Court Rules that apply to legal action for debt recovery. There are different Court Rules that the ATO must follow, depending on the amount of your tax debt and what State or Territory you live in. This letter usually warns you that the ATO is about to start debt recovery. It should give you the chance to ‘settle’ the debt before the ATO files the legal papers in Court. For example, In South Australia, the formal letter for a debt of over $100,000 is called a ‘Notice pursuant to rule 33’. The ATO sends this because the Court Rules say that an offer of settlement must be made before legal action for the debt can begin. These letters don’t offer what you or I would call a ‘settlement’; all these letters say is ‘pay the full amount, negotiate a payment plan, or we’ll take you to Court’. These letters aren’t required in all States, so you may not get one. If you haven’t dealt with your tax debt by the date in the formal letter (or if no formal letter was required), then the ATO can issue you with a Summons or a Writ for your debt. Again, the exact details of this document will depend on what State or Territory you live in. In South Australia, it is a Summons with a Statement of Claim. These are standard legal forms, with certain details filled in. The Statement of Claim will contain details of your tax debt. The Summons will tell you that, if you dispute the debt, you can file a Notice of Address for Service within 14 days and a Defence within 28 days. Even though the standard paperwork refers to a ‘defence’, it is actually very difficult to defend most tax debts. This is because the tax law essentially says – if the ATO says you owe a tax debt, then you owe a tax debt. This is known as the conclusive evidence rule. It is not a defence to say ‘I can’t pay my debt right now, but I can pay it over time’. If that is your situation, then it is best to try to negotiate a payment plan with the ATO, rather than spending money to file a defence in court. Judges must abide by the tax law. They cannot let you off the hook, even if they can see that you are doing your best to pay the tax debt. They also cannot force the ATO to negotiate a payment plan with you or allow you more time to pay your debt. The conclusive evidence rule applies even if you are disputing the tax debt. For example, even if you have lodged an objection or you are appealing an objection decision in the Administrative Appeals Tribunal (AAT) or Federal Court, the ATO can still pursue you for the tax debt through the courts, even if you are challenging their basis for taxing you. However, there are special rules for dealing with disputed tax debts. These rules may allow you to defer the ATO’s debt recovery action until you have finalised your dispute about whether you owe the tax debt in the first place. The conclusive evidence rule doesn’t mean that there is absolutely no defence to the debt – but it is unlikely. For example, in some cases, taxpayers may argue that the ATO was guilty of ‘conscious maladministration’. This means that the conduct of the ATO was so bad, that the assessment of tax made by the ATO is invalid. For this kind of defence to succeed, there needs to be more than just a mistake by the ATO in assessing the tax. There needs to be bad faith on the ATO’s part in how it treated you. This is a very difficult argument to prove. An exception to the conclusive evidence rule exists where you owe a debt under a Director’s Penalty Notice. This is a penalty that you can owe to the ATO because you are a director of a company that doesn’t pay its employee-related tax obligations (i.e. PAYG withholding tax and superannuation guarantee charge). The amount of the penalty is equal to the amount of these debts that the company hasn’t paid. Reasonable steps – you took all reasonable steps to make the company pay its tax debt, appoint an administrator or be wound up (or there were no reasonable steps available to you). These defences are very difficult to prove. They generally involve very careful negotiation with the ATO. You should consult a tax disputes expert if you have received a DPN and think that one of these defences may apply. In addition to the above defences, it is possible that the ATO has not followed the correct processes in issuing the Summons or Writ. For example, the paperwork may not have been served properly, or it may contain incorrect information. If this is the case, there may be an avenue for challenging it. You should have a tax law expert look at what you’ve received from the ATO as soon as possible. If there are avenues to challenge or defend the action, then you will need to act quickly. However, there is generally a slim chance that you have grounds for challenging or defending the ATO’s legal action. Some lawyers will recommend filing a defence because they think it will buy you time, or they don’t know about the conclusive evidence rule. 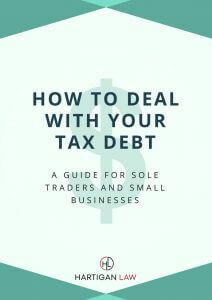 If you don’t have a defence or grounds for a challenge, then your time and effort are best spent on negotiating with the ATO about the debt (rather than filing a defence that is unlikely to succeed). Disputed tax debts – if you want to dispute the underlying tax debt (i.e. by lodging an objection or having it considered in the AAT or Federal Court), you should focus on lodging the dispute as soon as possible. Then you should work on convincing the ATO that their debt recovery action is inappropriate and that there may be another way to deal with the debt while the real dispute is being considered. These steps are not straightforward, particularly once the ATO has issued a Summons or a Writ. If you don’t file a defence against the Summons or Writ, and you don’t negotiate anything else with the ATO, then the ATO will go to court and ask for a ‘default judgment’ against you. This is essentially a rubber stamp by the judge that says, yes, you do actually owe the debt. The court will usually award costs to the ATO – this means that you will be liable to pay the ATO’s costs incurred in bringing the legal action against you. Once a judgment is made, judgment debt interest will start running on the debt. This is different from the general interest charge. The rate of interest will depend on what State or Territory you are in, and what Court made the judgment. Judgment debt interest is not tax deductible and cannot be remitted. That means that the longer you take to pay this amount, the more you will owe – and there is nothing you can do to reduce it. The other thing that happens when a judgment is made is that the ATO will list the judgment on your credit file. The ATO will not generally remove a default judgment from your credit report, even when you pay your debt. This can make it difficult for you to obtain any sort of loan while the default remains on your file. You may be able to obtain a ‘letter of comfort’ from the ATO to confirm payment. This may help to convince a lender that they should make a loan to you. Once the ATO has a judgment against you, it needs to enforce that judgment. The first step that the ATO takes in enforcing a judgment is to obtain a Bankruptcy Notice in your name, which is issued by the Official Receiver. The ATO must then have the Bankruptcy Notice served on you (e.g. by post or personal delivery). The ATO can obtain a Bankruptcy Notice at any time within 6 years of getting the judgment against you. don’t apply to the court to have the Bankruptcy Notice cancelled within a certain period of time (usually 21 days). If you commit an act of bankruptcy, the ATO is then allowed to ask the court to declare you bankrupt (this is known as a sequestration order). The act of bankruptcy allows the court to presume you are bankrupt – and you would need to provide a lot of evidence to prove otherwise. take legal action in relation to the Bankruptcy Notice – for example, if the ATO has made a mistake in the way it has obtained or served the Bankruptcy Notice (this is unlikely, but still worth checking for). If you don’t do one of these things, you will have a very hard time avoiding bankruptcy. it is issued more than 6 years after the ATO obtained the judgment. You should obtain legal assistance if you want to challenge a Bankruptcy Notice served on you by the ATO. It is a very technical process. There are forms that must be filed in the Federal Court and steps that must be closely followed in strict timeframes. There are also fees involved for making the application – as at 3 April 2018, the fee was $1,445 (these fees generally increase a small amount each year). If you don’t respond to the Bankruptcy Notice, or if you challenge it but you are unsuccessful, then the next step taken by the ATO is to file a Creditor’s Petition. The ATO must do this within 6 months of the ‘act of bankruptcy’ (i.e. when the 21 days to comply with the Bankruptcy Notice have expired). The Creditor’s Petition is an application by the ATO to the Federal Court to make a sequestration order, which is the order that officially declares you bankrupt. When the sequestration order is made, the court will order that your assets are to be managed by a Trustee in Bankruptcy. The Trustee appointed will either be a private trustee nominated by the ATO (which is unlikely), or the Official Trustee (which is part of the Australian Financial Security Authority). Usually, you will receive the Creditor’s Petition by having it served on your personally. The documents you receive will tell you when the Creditor’s Petition is being heard – that is, the first court date. Generally speaking, once the ATO has issued a Creditor’s Petition, it can be very difficult to avoid bankruptcy. This is because the Court can presume that you are bankrupt if you have committed an act of bankruptcy. It is then up to you to convince the Court otherwise. If you haven’t already sought professional help before this, then now is the time to do so. Things move very quickly once a Creditor’s Petition has been filed. You have a short window of time to avoid bankruptcy, so you need to see someone who knows what they’re doing and has experience. whether you can show that you are not actually bankrupt. It’s best to get help from a tax expert. This is because the ATO is very different from any other sort of creditor (e.g. a supplier or a bank). The ATO has a specific set of rules and policies about how it can reduce tax debts or negotiate payment plans. A tax debt expert will be able to help you to navigate this – you don’t have time for someone to ‘learn on the job’. I recently helped a client who received a Creditor’s Petition. You can read more about his story here. In his case, he had a tax debt of over $220,000. He and his accountant had been unsuccessfully trying to negotiate with the ATO about this debt for a while. They weren’t getting anywhere. The ATO had refused to remit the general interest charge and penalties, and wouldn’t agree to the payment plans that had been proposed. The ATO had gone through all of the steps – they had sent him a summons, obtained a default judgment against him, issued a Bankruptcy Notice and finally sent him a Creditor’s Petition. In his particular case, I identified that he was a good candidate for a release of some of his tax debt. After a lot of negotiating back and forth, and after filing various documents in the Court, I resolved his problem. I was able to get his debt down to around $40,000, which he was able to pay. The Court then dismissed the Creditor’s Petition, and the whole thing was over. If the ATO has taken any of these legal action steps against you, then you should start by getting advice from an expert. Find out about your options. Can you reduce the tax debt? Can you negotiate a plan to pay your tax debt over time? Is there a legitimate dispute about the tax debt? The sooner you get advice from the right person, the more options you should have.